Temperature Control Units provide control of process temperatures by circulating water or a oil based fluid through the process application. This results in heating of the application and temperature control of the process. Temperature controll units service a single process at any one time. 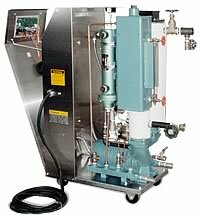 They are designed to be moved between process applications as the need requires.These units use a pump to circulate the fluid through the process. A heater and a cooling valve work together to control the fluid temperature. Temperature control units are portable and require a plant water supply source and are available with a variety of different control instruments, heater sizes, cooling vales, and physical packages. Water units circulate process water for temperature control from 30° to 250°F. Advantage & Temptek units are recognized as having the highest quality of parts and craftmanship in the industry. Models are available with 3 choices of microprocessor control instruments, with high capacity centrifugal pumps from 3/4 to 7.5 HP and heaters from 10 to 36KW. Each model has stainless steel cabinetry, pumps, AVT™ modulating or solenoid cooling valves. Oil Units circulate high temperature oil based fluid for temperature control from 100° to 500°F. Units have the highest quality parts and craftmanship in the industry and critical over temperature and low flow limit devices for safety. Models are available with 2 choices of microprocessor control instruments, with high flow process pumps from 1 to 7.5 HP with water-cooled pump seals and low watt density heaters from 12 to 48KW. Each model has stainless steel cabinetry. Optional water-to-fluid heat exchangers offer qiuck cooling. 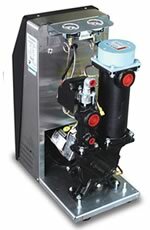 Air-cooled units use air-to-fluid heat exchangers for cooling. High temperature limit switches provide operator safety.